I neither understood nor appreciated the importance of quality running socks until last week. Yes, I own a pack of three great, legit, running socks, but I just figured they were comfortable but overpriced. I didn't see the point in buying more. I figured I could just buy a pack of low cut Puma socks from TJ Maxx, and they would do the same thing as my fancy Road Runner Sports running socks. Boy, was I wrong. All it took for me to quickly learn the error of my ways was to go on a few long runs. About three miles in to each run, almost to the exact distance, I would start having weird pains in different parts of my feet. First, it would start in the ball of my foot. There was internal and external pain. It hurt! Then, my heels would start having the same pain as the ball of my foot. Sometimes, I would have to sort of trot, just to ease some of the pain. At the end of those runs, my arches would be screaming! I remember being perplexed, until I realized what the problem was. I wasn't wearing socks with proper cushioning, compression, and support! I'd never really had any issues with blisters on my feet before I started running in those cheap socks, and that even includes whenever I break in a new pair of athletic shoes -- including volleyball shoes! I had no idea that socks mattered that much. I figured it was just a marketing gimmick. I wish someone had told me sooner! Nonetheless, I now know that quality running socks are extremely important. It's especially important to find socks that work with your feet (and wallet). I know that I need some extra cushioning and stabilization/compression, and that I like socks with the tab at the heel to prevent them from sliding down or scraping the back of my heel against the inside of my shoes. 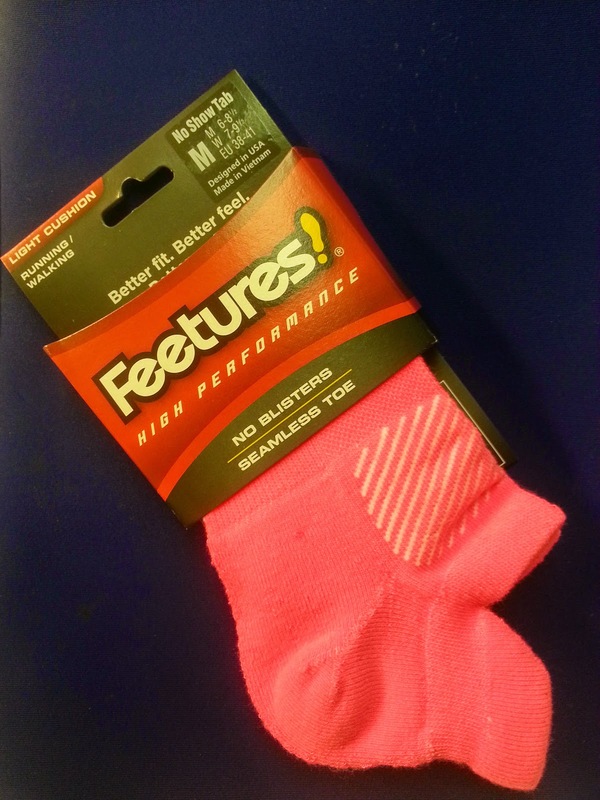 I decided to head on over to my local Road Runner store to see if I could buy an additional pack of the brand of fancy running socks I already owned, as those always worked like a charm on my feet. I trust the sales associates there to help me make smart decisions, since they're the experts. The sales associate who assisted me talked to me to about my needs, and the issues I was having with the other socks. 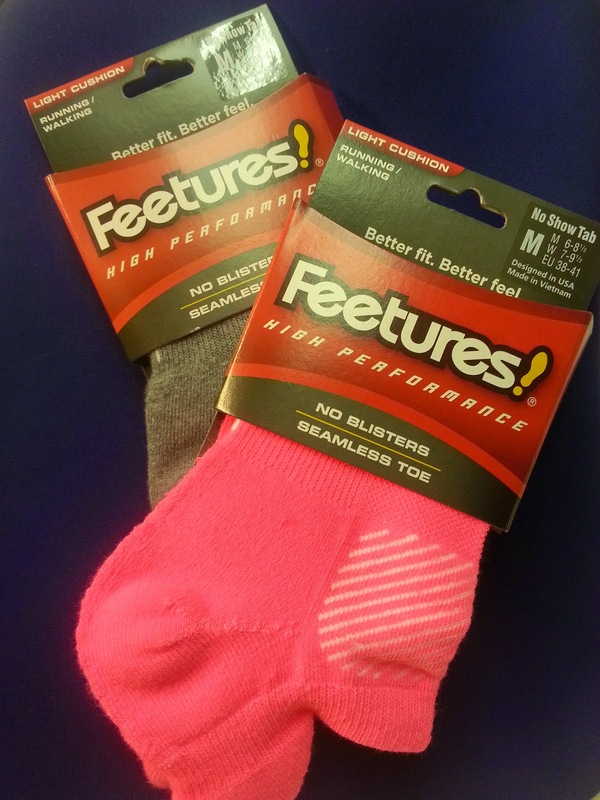 Instead of purchasing more of those same fancy socks, she talked me into trying out Feetures. I'd heard of them before, but didn't know much about them. There were plenty of options, and tons of colors. It was actually a little overwhelming, but she really helped me narrow in on the exact kind I should try out. Note: I'm extremely cheap, so the fact that they were on a good promotion was another check mark in the YES column. I ended up buying three pairs of the Feetures socks, and took my first pair for a spin later that day. I'll be honest: Breaking in a pair of shoes and trying out brand new running socks was probably not a great idea. While my left foot felt amazing -- and it's the foot that usually bothers me the most -- my right foot was in so much pain that I had to take my sock and shoe off as soon as I completed my run because I was limping so badly, and felt like I couldn't straighten out my foot. I didn't even care that other people at the park were giving me the stink eye. I sat down on a bench and massaged the heck out of that poor foot until I felt like I could walk the rest of the way to my car. On test run number two, I was smarter, and was able to really focus on testing out the new socks. They're great! I had no pain in my feet, and I actually felt much better circulation in my left foot and leg. The cushioned tab at the heel is also a great feature (or Feeture), and prevented my socks from slipping down. Another great thing about these socks is that they didn't get all soggy like some of my other socks. They actually were great with moisture control, which is something I've seriously been missing in my life. If you're a new runner like I am, do yourself a favor and invest in some good running socks. They might seem pricey, but they're definitely worth paying more than 50 cents a pair like I was doing with my TJ Maxx socks. You get what you pay for, as the saying goes! Do you wear special socks for running, or any other sport you play? Which brand of running socks do you like the best? Are there any other beginner mistakes I can avoid before they strike? Man, I am so glad I was introduced to those socks! Are there any other brands you'd recommend? Do those have much compression? They're super cute!